Frasier is an American sitcom that was broadcast on NBC for eleven seasons, premiering on September 16, 1993, and concluding on May 13, 2004. The program was created and produced by David Angell, Peter Casey, and David Lee (as Grub Street Productions) in association with Grammnet (2004) and Paramount Network Television. The series was created as a spin-off of Cheers, continuing the story of psychiatrist Frasier Crane as he returned to his hometown of Seattle and started building a new life. Frasier stars Kelsey Grammer, David Hyde Pierce, John Mahoney, Jane Leeves, Peri Gilpin, and Dan Butler. Psychiatrist Dr. Frasier Crane (Grammer) returns to his home town of Seattle, Washington, following the end of his marriage and his life in Boston (as seen in Cheers). His plans for a new life as a bachelor are complicated when he is obliged to take in his father, Martin (Mahoney), a retired Seattle Police Department detective, who has mobility problems after being shot in the line of duty during a robbery. Frasier hires Daphne Moon (Leeves) as Martin's live-in physical therapist and care giver, and tolerates Martin's dog Eddie. Frasier frequently spends time with his younger brother Niles (Pierce), a fellow psychiatrist. Niles becomes obsessed with, and eventually falls in love with, Daphne (notwithstanding his own marriage), but does not confess his feelings to her until the final episode of the seventh season. Frasier hosts The Dr. Frasier Crane Show, a call-in psychiatry show on talk radio station KACL. His producer Roz Doyle (Gilpin) is very different from Frasier in many ways. She is down-to-earth, has basic tastes and, at least early in the series, has superficial relationships with many men. However, Roz and Frasier share a professional respect and over time they become best friends. Frasier and the others often visit the local coffee shop, Café Nervosa. The Crane sons, who possess fine tastes, intellectual interests, and high opinions of themselves, frequently clash with their blue-collar, Average Joe father. The brothers' close relationship is often tense, and their sibling rivalry intermittently results in chaos. Other recurring themes include the breakdown of Niles' marriage to the never-seen Maris, Frasier's search for love, Martin's new life after retirement, and the various attempts by the two brothers to gain acceptance into Seattle's cultural elite. Frasier Crane (Kelsey Grammer), a radio psychiatrist. Niles Crane (David Hyde Pierce), Frasier's younger brother, also a psychiatrist, who works in private practice. Martin Crane (John Mahoney), Frasier and Niles's father, a police officer who was forced to retire because of a gunshot wound to his hip that led to his living with Frasier. Daphne Moon (Jane Leeves), an English physiotherapist, hired by Frasier to help take care of Martin, who lives with them in Frasier's apartment. Roz Doyle (Peri Gilpin), the producer of Frasier's radio show, who becomes a close family friend. "Eddie" (Moose (1993–2000), then Enzo (2000–04), Martin Crane's Jack Russell terrier. Bob "Bulldog" Briscoe (Dan Butler), the male chauvinist, horny, boastful host of a sports radio-talk-show that followed Frasier's daily broadcast at KACL. He became a regular cast member for Seasons 4 through 6. Noel Shempsky (Patrick Kerr), KACL technical assistant and avid Star Trek aficionado who speaks Klingon; in love with Roz. Gil Chesterton (Edward Hibbert), KACL's flamboyant, effeminate, restaurant critic. Kenny Daly (Tom McGowan), KACL's station manager. Bebe Glazer (Harriet Sansom Harris), Frasier's manipulative, amoral agent, who is loathed by Frasier's family. Gertrude Moon (Millicent Martin), Daphne's Mancunian mother with a one-sided affection for Martin. The main cast remained unchanged for all 11 years. Adding to his nine seasons on Cheers, Grammer tied the record for the longest running character in prime time, equaling James Arness' twenty years as Marshal Dillon on Gunsmoke. This was surpassed by the principal cast of The Simpsons, although Grammer and Arness still held the record for live-action series. Grammer was briefly the highest paid television actor in the United States for his portrayal of Frasier, while Jane Leeves was the highest paid British actress. In addition to those of the ensemble, additional story-lines included characters from Frasier's former incarnation on Cheers, such as his ex-wife Lilith Sternin, played by Bebe Neuwirth and their son Frederick, played by Trevor Einhorn. Grammer had been the voice of Sideshow Bob on The Simpsons since 1990. In a 1997 episode (while Frasier was still in production), the character's brother, Cecil Terwilliger, was introduced, played by Pierce, as referenced in the episode title, "Brother from Another Series". The episode contained numerous Frasier references. Pierce returned as Cecil for the second time (the first since Frasier had concluded) alongside Grammer in the 2007 episode "Funeral for a Fiend". The episode introduced the brothers' father, Dr. Robert Terwilliger, who was portrayed by Mahoney. Cast member reunions also occurred on four episodes of Hot in Cleveland, which featured Leeves in the main cast along with Wendie Malick (who played Martin's girlfriend towards the end of Frasier). In the Season 2 episode "Unseparated at Birth" and Season 3 episode "Funeral Crashers", Mahoney guest stars as a waiter smitten with Betty White's character. Gilpin appears in the episode "I Love Lucci (Part 1)", and Tom McGowan (who played Kenny Daly) appears in "Love Thy Neighbor" as a casting director. Hot in Cleveland was produced by Suzanne Martin, who wrote multiple episodes of Frasier. During the 8th season of Cheers, Grammer made a deal with former Cheers producers David Angell, Peter Casey, and David Lee (who were moving on to produce Wings) that they would do a new series together once Cheers ended. Once it became clear during the 10th season that the 11th would be the last, the group began working on their next series together. Grammer did not originally want to continue playing Frasier Crane, and Angell, Casey, and Lee did not want the new show to be compared to Cheers, which they had worked on before Wings. The three proposed that the actor play a wealthy, Malcolm Forbes-like paraplegic publisher who operated his business from his apartment. The main show featured a "street smart" Hispanic live-in nurse who would clash with the main character. While Grammer liked the concept, Paramount Television disliked it, and suggested that the best route would be to spin off the Frasier Crane character. Grammer ultimately agreed to star in a Cheers spin-off, but the producers set the new show as far from Boston as possible to prevent NBC from demanding that other characters from the old show make guest appearances on the new show during its first season. After first choosing Denver, Angell, Casey, and Lee ultimately chose Seattle as the setting. The creators did not want Frasier in private practice, which would make the show resemble The Bob Newhart Show. Taking from an unused idea they'd had for a Cheers episode, they conceived the idea of the psychiatrist working in a radio station surrounded by "wacky, yet loveable" characters. After realizing that such a setting resembled WKRP in Cincinnati, the creators decided to emphasize Frasier's home life, which Cheers had rarely explored. 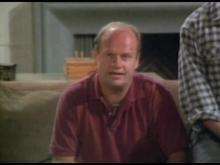 Lee's thought of his own experiences with "the relationship between an aging father and the grown-up son he never understood" and thought it would be a good theme for Frasier. Although Frasier had mentioned on Cheers that his father, a research scientist, had died, it was decided to overlook the discrepancy (which they attempted to explain in a second-season episode). One element of the original concept that was carried over was the live-in health-care provider which would be for Frasier's father. Grammer points out that very little of the Frasier Crane of Cheers carried over to Frasier, as his family history was changed, the setting, his job and even the character itself changed from its Cheers predecessor, having to be more grounded as the central character of the show so the other supporting characters could be more eccentric. Martin Crane was based on creator Casey's father, who spent 34 years with the Seattle Police Department. The creators suggested to NBC that they'd like to cast someone like Mahoney, to which NBC told them if they could get Mahoney, they could hire him without auditions. Both Grammer and the producers contacted Mahoney, with the producers flying to Chicago to show Mahoney the pilot script over dinner. Upon reading the script, Mahoney accepted. Grammer, who lost his father as a child, and the childless Mahoney immediately built a close father-son relationship. In discussing Martin's nurse, Warren Littlefield of NBC suggested she be English instead of Hispanic and suggested Leeves for the role. Grammer was initially reluctant as he thought the casting made the show resemble Nanny and the Professor, but approved Leeves after a meeting and read-through with her. Mahoney and Leeves quickly bonded over their shared English heritage; Mahoney is originally from Manchester where Leeves's character is from. The character of Niles was not part of the original concept for the show. Frasier had told his bar friends on Cheers that he was an only child. However, Sheila Guthrie, the assistant casting director on Wings brought the producers a photo of Pierce (whom she knew from his work on The Powers That Be) and noted his resemblance to Grammer when he first appeared on Cheers. She recommended him should they ever want Frasier to have a brother. The creators were "blown away" both by his resemblance to Grammer and by his acting ability. They decided to ignore Frasier's statement on Cheers and created the role for Pierce. Pierce accepted the role before realizing he hadn't read a script. Once he was given a script, he was initially concerned that his character was essentially a duplicate of Frasier, thinking that it would not work. The first table reading of the pilot script was notable because the producers had never heard either Pierce or Mahoney read lines because they were cast without auditions. The original focus of the series was intended to be the relationship between Frasier and Martin, and it was the focus of most of the first-season episodes. Once the show began airing, Niles became a breakout character, and more focus was added to the brothers' relationship, and other plots centering on Niles, starting in the second season. The producers initially did not want to make Niles's wife Maris an unseen character because they did not want to draw parallels to Vera, Norm's wife on Cheers. They originally intended that she would appear after several episodes, but were enjoying writing excuses for her absence that eventually it was decided she would remain unseen, and after the increasingly eccentric characteristics ascribed to her, no real actress could portray her. Frasier's apartment was designed to be ultra-modern in an eclectic style (as Frasier himself points out in the pilot). One of the show's signature elements that it became well known for was the apartment's design which included elements such as a slightly split-level design, doors with triangular wooden inlay features, numerous pieces of well-known high-end furniture pieces (such as a replica of Coco Chanel's sofa, and both Eames and Wassily Chairs) and a notable view from the terrace which was frequently complimented by visitors. The main set consisted of the open-concept living area with a sitting/TV space and dining area on the lower level and a piano exit to the terrace on the rear upper level. The set also included the kitchen through an open archway. A small section of the building corridor and elevator doors was built, as was a powder room near the front entrance. Two corridors off the living area ostensibly led to the apartment's three bedrooms. Sets for each of these rooms were built as separate sets on an as-needed basis. No building or apartment in Seattle really has the view from Frasier's residence. It was created so the Space Needle, the most iconic landmark of Seattle, would appear more prominently. According to the Season 1 DVD bonus features, the photograph used on the set was taken from atop a cliff, possibly the ledge at Kerry Park, a frequent photography location. Despite this, Frasier has been said to have contributed to the emergence of an upscale urban lifestyle in 1990s Seattle, with buyers seeking properties in locations resembling that depicted in the show, in search of "that cosmopolitan feel of Frasier". The producers wanted to have a gathering place outside of home and work where the characters could meet. After a trip to Seattle, and seeing all of the burgeoning coffee shops, the production designer suggested to producers that they use a coffee shop. Unlike many of the relatively modern coffee shop designs prevalent in Seattle, the production designer opted for a more warm and inviting style which would appear more established and traditional. Stools were specifically omitted to avoid any similarity to the bar on Cheers. Several Los Angeles coffee shops were used for reference. A bookcase was added the back wall suggesting patrons could grab a book and read while they enjoyed their coffee. The show used three versions of the interior set depending on how much space other sets for each episode required. If there was not space for the full set, a smaller version that omitted the tables closest to the audience could be used. If there wasn't space for that set, a small back section of the back of the cafe at the top of the steps could be set up under the audience bleachers. A set was also used on occasion for the exterior patio. The cast had an unusual amount of freedom to suggest changes to the script. Grammer used an acting method he called "requisite disrespect" and did not rehearse with the others, instead learning and rehearsing his lines once just before filming each scene in front of a live studio audience. Although effective, the system often caused panic among guest stars. In 1996 Grammer's recurrent alcoholism led to a car accident; the cast and crew performed an intervention that persuaded him to enter the Betty Ford Clinic, delaying production for a month. The KACL callers' lines were read by anonymous voice-over actors during filming in front of a live audience, and during post-production, the lines were replaced by celebrities, who actually phoned in their parts without having to come in to the studio. The end credits of season finales show greyscale headshots of celebrities who had "called in" that season. Numerous celebrities called in, including Phil Donahue, Marlo Thomas, Olympia Dukakis, Daryl Hannah, Christopher Reeve, Gary Sinise, Freddie Prinze, Jr., Laura Linney, and Estelle Parsons. Some "callers" also guest starred, such as Parsons and Linney, who played Frasier's final love interest in the last season. The show's theme song, "Tossed Salads and Scrambled Eggs", is sung by Grammer and is played over the closing credits of each episode. Composer Bruce Miller, who had also composed for Wings, was asked to avoid explicitly mentioning any subjects related to the show such as radio or psychiatry. After Miller finished the music, lyricist Darryl Phinnesse suggested the title as they were things that were, like Frasier Crane's patients, "mixed up". The lyrics indirectly refer to Crane's radio show; "I hear the blues a-callin", for example, refers to troubled listeners who call the show. Grammer recorded several variations of the final spoken line of the theme which were alternated between for each episode. Other than season finales, a short, silent scene, often revisiting a small subplot aside from the central story of the episode, appears with the credits and song, which the actors performed without written dialogue based on the scriptwriter's suggestion. The title card at the start of each episode shows a white line being drawn in the shape of the Seattle skyline on a black background above the show's title. In most episodes, once the skyline and title appear, the skyline is augmented in some way. For example, with windows lighting up, a raincloud appearing, or a helicopter lifting off. The color of the title text changed at the beginning of each season (respectively: blue, red, green, purple, gold, orange, yellow, light green, light orange, silver, and metallic gold). Over the title card, one of about 25 brief musical cues evoking the closing theme is played. With the exception of Kirstie Alley (Rebecca Howe), all the surviving main regular cast members of Cheers made appearances on Frasier, but Bebe Neuwirth (Lilith Sternin) was the only one to become a recurring character. Some cast members of Frasier had appeared previously in minor roles on Cheers. In the episode "Do Not Forsake Me, O' My Postman" (1992), John Mahoney played Sy Flembeck, an over-the-hill advertising executive hired by Rebecca to write a jingle for the bar. In it, Grammer and Mahoney exchanged a few lines. Peri Gilpin appeared in a Cheers episode titled "Woody Gets an Election" playing a reporter who interviews Woody when he runs for office. In the eighth-season Cheers episode "Two Girls for Every Boyd", Frasier tells Sam Malone (played by Ted Danson) that his father, a research scientist, had died. In the Frasier Season 2 episode "The Show Where Sam Shows Up", when Sam meets Martin, Frasier explains that at the time, he was angry after an argument with his father on the phone. In "The Show Where Woody Shows Up", when meeting Martin, Woody says he remembers hearing about him, probably from Sam talking about his experiences in Seattle when he returned to Boston. In the ninth-season episode, "Cheerful Goodbyes" in 2002, Frasier returns to Boston to give a speech and Niles, Daphne and Martin come along to see the city. Frasier runs into Cliff Clavin (played by John Ratzenberger) at the airport and learns that Cliff is retiring and moving to Florida. Frasier and company attend Cliff's retirement party where Frasier reunites with the rest of the gang from Cheers (minus Sam, Woody and Rebecca), including bar regular Norm Peterson (played by George Wendt), waitress Carla Tortelli (played by Rhea Perlman), barflies Paul Krapence (played by Paul Willson) and Phil (played by Philip Perlman) and Cliff's old post office nemesis Walt Twitchell (played by Raye Birk). In the eleventh-season episode of Frasier, "Caught in the Act", Frasier's married ex-wife, children's entertainer Nanny G, comes to town and invites him backstage for a rendezvous. Nanny G appeared on the Cheers episode "One Hugs, The Other Doesn't" (1992) and was portrayed by Emma Thompson. In this episode of Frasier she is portrayed by Laurie Metcalf. She also appeared in the second episode of Season 9 of Frasier, "Don Juan in Hell: Part 2" and was played by Dina Waters. The set of Frasier itself was built over the set of Cheers on the same stage after it had finished filming. The producers of Frasier made certain there were no stools in the coffee shop in order to distance it visually from the Cheers bar. Critics and commentators broadly held Frasier in high regard. Caroline Frost said that the series overall showed a high level of wit, but noted that many critics felt that the marriage of Daphne and Niles in season ten had removed much of the show's comic tension. Ken Tucker felt that their marriage made the series seem desperate for storylines, while Robert Bianco felt that it was symptomatic of a show that had begun to dip in quality after so much time on the air. Kelsey Grammer acknowledged the creative lull, saying that over the course of two later seasons the show "took itself too seriously". Commentators do, however, acknowledge that there was an improvement following the return of the writers Christopher Lloyd and Joe Keenan, although not necessarily to its earlier high standards. Writing about the first season, John O'Connor described Frasier as being a relatively unoriginal concept, but said that it was generally a "splendid act", while Tucker thought that the second season benefited greatly from a mix of "high and low humor". Tucker's comment is referring to what Grammer described as a rule of the series that the show should not play down to its audience. Kevin Cherry believes that Frasier was able to stay fresh by not making any contemporary commentary, therefore allowing the show to be politically and socially neutral. Other commentators, such as Haydn Bush disagree, believing the success of Frasier can be attributed to the comedic timing and the rapport between the characters. In spite of the criticisms of the later seasons, these critics were unanimous in praising at least the early seasons, with varied commentary on the series' demise ranging from believing, like Bianco, that the show had run its course to those like Dana Stevens who bemoaned the end of Frasier as the "end of situation comedy for adults". Critics compared the farcical elements of the series, especially in later seasons, to older sitcom Three's Company. NBC News contributor Wendell Wittler described the moments of misunderstanding as "inspired by the classic comedies of manners as were the frequent deflations of Frasier’s pomposity." Frasier is one of the most successful spin-off series in television history and one of the most critically acclaimed comedy series of all time. The series has won a total of 37 Primetime Emmy Awards during its 11-year run, breaking the record long held by The Mary Tyler Moore Show (29). It held the record until 2016 when Game of Thrones won 38. Grammer and Pierce each won four, including one each for the fifth and eleventh seasons. The series is tied with ABC's Modern Family for the most consecutive wins for Outstanding Comedy Series, winning five from 1994 to 1998. Grammer has been Emmy-nominated for playing Frasier Crane on Cheers and Frasier, as well as a 1992 crossover appearance on Wings, making him the only performer to be nominated for playing the same role on three different shows. The first year Grammer did not receive an Emmy nomination for Frasier was in 2003 for the tenth season. However, Pierce was nominated every year of the show's run, breaking the record for nominations in his category, with his eighth nomination in 2001; he was nominated a further three times after this. In 1994, the episode "The Matchmaker" was ranked No. 43 on TV Guide's 100 Greatest Episodes of All Time. In 2002, Frasier was ranked No. 34 on TV Guide's 50 Greatest TV Shows of All Time. "The Show Where Lilith Comes Back"
"Martin Does It His Way"
On April 7, 2015, CBS DVD released Frasier- The Complete Series on DVD in Region 1. 1 2 McFadden, Kay. "Condo by condo, Seattle has become a lot like 'Frasier'". Seattle Times, May 13, 2004. 1 2 Gorman, Steve (June 3, 2008). "Kelsey Grammer has heart attack". The Independent. London. Archived from the original on February 27, 2010. Retrieved February 20, 2009. ↑ Frost, Caroline (2003-01-24). "Frasier: Goodnight Seattle...". BBC News. Retrieved February 20, 2009. 1 2 3 4 Casey, Peter. "How FRASIER came to be". kenlevine.blogspot.com. Retrieved December 25, 2010. 1 2 3 4 5 Newman, Bruce (March 1, 1998). "All in Their Family". Los Angeles Times. Retrieved February 20, 2009. 1 2 ComedyFan2010 (June 9, 2014). ""Cheers" Two Girls for Every Boyd (TV Episode 1989)". IMDb. Retrieved June 15, 2015. ↑ Littlefield, Kinney (December 23, 1993). "Custom Casting Got Pierce the Niles Role on 'Frasier'". Chicago Tribune. Retrieved February 20, 2009. ↑ Harris, Joyce Saenz (May 5, 1996). "Dallas actress finds second home on Frasier". The Dallas Morning News. ↑ Casey, Peter. "FRASIER starring Lisa Kudrow?". kenlevine.blogspot.com. Retrieved December 25, 2010. ↑ Zaslow, Jeffrey (October 8, 2000). "Balancing friends and family". USA Weekend. Retrieved April 17, 2010. ↑ "Frasier–Season 5, Episode 5: The 1000th Show–TV.com". TV.com. CBS Interactive. Retrieved June 15, 2015. 1 2 Levine, Ken (April 9, 2012). "The story behind "Tossed Salad and Scrambled Eggs"". ...by Ken Levine. Retrieved April 9, 2012. ↑ Levine, Ken (August 10, 2012). "What you see is what we show you". ...by Ken Levine. Retrieved August 10, 2012. ↑ ComedyFan2010 (June 29, 2014). ""Cheers" Do Not Forsake Me, O' My Postman (TV Episode 1992)". IMDb. Retrieved June 15, 2015. ↑ ComedyFan2010 (July 13, 2014). ""Cheers" Woody Gets an Election (TV Episode 1993)". IMDb. Retrieved June 15, 2015. ↑ "Frasier Online Episode Guide: Episode 2.16–The Show Where Sam Shows Up". frasieronline.co.uk. Retrieved June 15, 2015. ↑ "Frasier Online Episode Guide: Episode 6.13–The Show Where Woody Shows Up". frasieronline.co.uk. Retrieved June 15, 2015. ↑ "Frasier Online Episode Guide: Episode 9.20–Cheerful Goodbyes". frasieronline.co.uk. Retrieved June 15, 2015. ↑ ComedyFan2010 (June 26, 2014). ""Cheers" One Hugs, the Other Doesn't (TV Episode 1992)". IMDb. Retrieved June 15, 2015. ↑ "Frasier Online Episode Guide: Episode 11.15–Caught In The Act". frasieronline.co.uk. Retrieved June 15, 2015. ↑ "Frasier Online Episode Guide: Episode 9.01–Don Juan In Hell". frasieronline.co.uk. Retrieved June 15, 2015. ↑ Mandese, Joe (January 12, 2004). "Frasier Move May Put NBC on the Couch". Media Daily News. MediaPost Publications. Retrieved June 28, 2014. ↑ Frost, Caroline (January 24, 2003). "Frasier: Goodnight Seattle...". BBC News. BBC. Retrieved April 22, 2009. 1 2 Tucker, Ken (November 18, 2003). "TV Review: Frasier". Entertainment Weekly. Retrieved April 22, 2009. ↑ Bianco, Robert (May 12, 2004). "Sophisticated 'Frasier' signs off". USA Today. USA Today. Retrieved April 22, 2009. 1 2 Levin, Gary (March 29, 2004). "'Frasier' has left the building". USA Today. USA Today. Retrieved April 22, 2009. 1 2 Cherry, Kevin M. (January 16, 2004). "Four for the Road: Frasier Crane won't die this season". National Review. National Review Online. Retrieved April 22, 2009. ↑ O'Connor, John J. (October 21, 1993). "Review/Television; A 'Cheers' Spinoff, Set in Seattle". The New York Times. New York: New York Times. p. 22. Retrieved April 22, 2009. ↑ Tucker, Ken (April 28, 1995). "TV Review: The Crane Gang". Entertainment Weekly. Retrieved April 22, 2009. ↑ "Listening to Kelsey Grammer". WSJ Opinion Archives. The Wall Street Journal. April 22, 2004. Retrieved April 22, 2009. ↑ Bush, Haydn (February 8, 2000). "TV Review: 'Frasier' romance critical for series". University Wire. Retrieved April 22, 2009. ↑ Stevens, Dana (May 12, 2004). "Where Have All the Grown-Ups Gone". Slate Magazine. Washington Post. Retrieved April 22, 2009. 1 2 Wittler, Wendell (May 14, 2004). "Frasier finale didn't need gimmicks". "Today" from NBC News. ↑ Hiltbrand, David (May 2, 2004). "Fading fast Friends and Frasier follow a long line of sitcoms that wilted before they went". Philly.com. ↑ Roberson, Matthew (2002). 1998.6. Tallahassee, Florida: Fiction Collective Two. p. 11. ISBN 1-57366-102-3. ↑ Waters, Darren (July 24, 2003). "TV's obsession with spin-offs". BBC. Retrieved January 4, 2010. ↑ Dockterman, Eliana (September 18, 2016). "Game of Thrones Now Has the Most Emmy Wins Ever". Time. Retrieved September 19, 2016. ↑ Barnes, Anthony (September 6, 2000). "Just don't tell the Major, Fawlty is our favourite". Birmingham Post. Birmingham: Trinity Mirror. ISSN 0963-7915. OCLC 500151397. Retrieved October 18, 2016. ↑ "TV Guide Names Top 50 Shows". cbsnews.com. April 26, 2002. Retrieved June 15, 2015. ↑ Wezzo (January 3, 2006). "Channel 4's Ultimate Sitcom". Listology. Retrieved February 25, 2008. 1 2 "TV Ratings: 1993–1994". ClassicTVHits.com. Archived from the original on January 6, 2010. Retrieved January 9, 2010. 1 2 "TV Ratings: 1993–1994". ClassicTVHits.com. Archived from the original on October 26, 2009. Retrieved January 9, 2010. 1 2 "TV Ratings: 1995–1996". ClassicTVHits.com. Archived from the original on November 9, 2009. Retrieved January 9, 2010. 1 2 "TV Ratings: 1996–1997". ClassicTVHits.com. Archived from the original on January 6, 2010. Retrieved January 9, 2010. 1 2 "TV Ratings: 1997–1998". ClassicTVHits.com. Archived from the original on January 3, 2010. Retrieved January 9, 2010. 1 2 "TV Ratings: 1998–1999". ClassicTVHits.com. Archived from the original on January 6, 2010. Retrieved January 9, 2010. 1 2 "US-Jahrescharts 1999/2000". May 30, 2002. Retrieved January 9, 2010. 1 2 "The Bitter End". ew.com. June 1, 2001. Retrieved January 9, 2010. 1 2 "How did your favorite show rate?". USA Today. May 28, 2002. Retrieved January 9, 2010. 1 2 "Nielsen's TOP 156 Shows for 2002–03". Retrieved January 9, 2010. 1 2 "I. T. R. S. Ranking Report: 01 Thru 210". ABC Medianet. Archived from the original on September 30, 2007. Retrieved May 25, 2007. ↑ "Frasier DVD news: Announcement for Frasier–The Complete Series–TVShowsOnDVD.com". tvshowsondvd.com. Retrieved June 15, 2015.